The European pigs-mature-for-slaughter market is finally characterised by increasing quotations in many EU member countries. 13 February 2019, at 12:11p.m. This week ISN (Interessengemeinschaft der Schweinehalter Deutschlands) reports that quantities of live pigs on offer has considerably decreased, thus causing a tight supply situation and marginally increasing the German quotation. As a consequence, the Spanish, Danish, French, Belgian, Austrian, and British quotations also increased. This said, at present the decrease in quantities of pigs for slaughter is being used to fuel ongoing disputes in Germany over carcass prices. 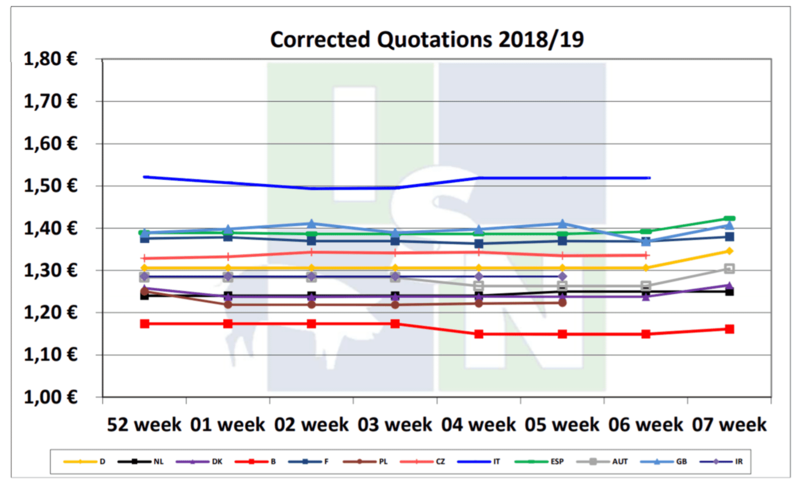 Despite the manageable quantities of live pigs on offer, some German slaughter companies are not accepting the latest increase of quotations, hence are continuing to pay discounted prices. As justifies the meat-processing industry, the European meat market was sufficiently supplied. In Austria, where backlog supply had been noted until most recently, the market has been cleared. In Spain, however, slaughter weights are decreasing more than they did over the same period in 2018, as may be observed in market reports. Tension is indeed present across the borders and among the market participants because of the situation as it currently stands in Germany. Despite discounted prices being paid, no increase in the supply pressure was observed. So for that reason, the price development may be expected to remain unchanged for the week of slaughter to come.